I have to admit that I actually did laugh out loud when I read this sentiment for my card. So many cat people already know how true this is!! I could not help but think that it would be fun to create a card starting with just one kitty and then revealing the rest. So a pop-up card was born. I masked, stamped and colored this cutie with Copics and then added the yellow with Distress Ink. I stamped the whole image again and then colored kitties of every kind. I fussy cut them out and made a pop up feature. And then I added the rest of the sentiment. Isn’t it just perfect??!!! I love it! This is absolutely fantastic! What a great idea and fabulous design!!! yes you cant have just one cat! Oh I love the surprise inside! Awesome card! Love these kitties! Cute.., love the surprise pop up. Great card, so clever, clean and simple outside and amazing fun pop inside! Fabulous design using the single cat on the front and a whole bunch on the inside….as a pop-up, no less!! So creative and absolutely wonderful coloring!! Your idea of the “inside – outside” is really excellent, I love it ! Your card is beautiful, this is a great card. This is one of the cutest cards I have ever seen. The sentiment if perfect. 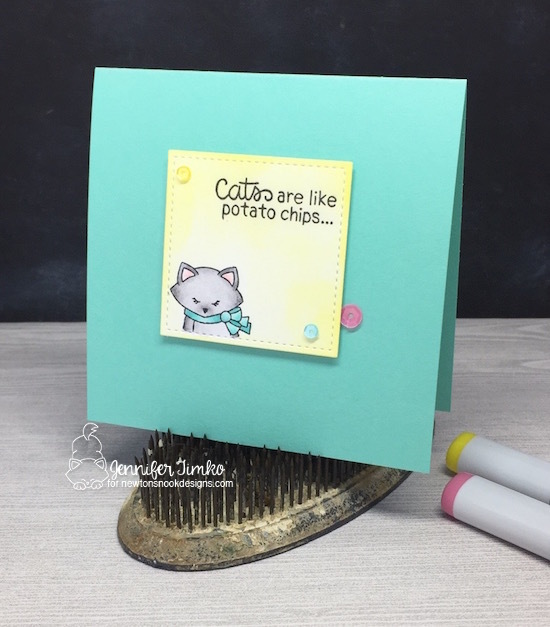 I LOVE your popped out inside card cats….your coloring is just gorgeous, and your design is beautiful!!! Love your soft inky yellow square as well! Purrfect!! Love the way your design plays on the sentiment. Great pop-up. I like how you broke up the image to use on different parts of the card. Very creative! This card is awesome, that was unexpected, love the pop up inside! I adore how you broke these guys up and made a pop up! LOVE that sentiment, too!! Love this new stamp from Newton’s Designs. I enjoy your interpretation of the sentiment with the stamp. Very cute. This is super sweet and fun card ! Congratulations ! I agree that is a cool sentiment. Love how you broke up the images. What a fabulous pop up card and so funny cute, too. That sentiment is the best! fun and super cute!! great coloring! This might be my favorite card of the bunch. I love a good outside to inside continuation of the thought. And the little popped up kittens are so cute! Thanks for sharing. Wow! Love so much how you colored these adorable kitties!!! Cute card!!! 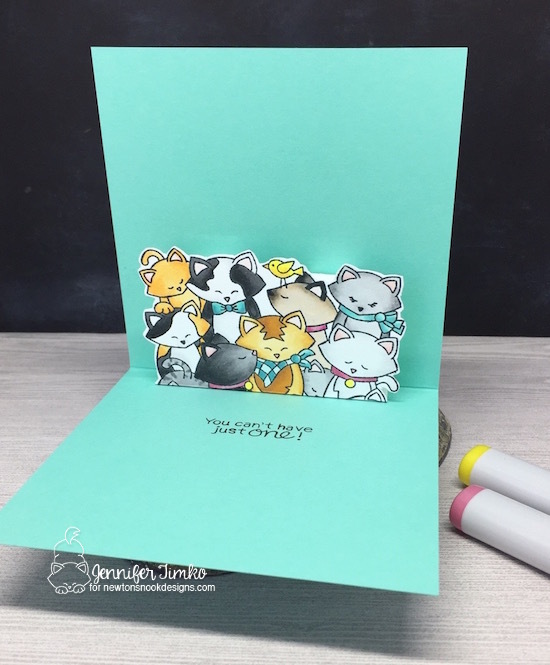 I absolutely love these amazing ideas, and this stamp is just adorable! Such a sweet card! I love the cat pop-up on the inside! 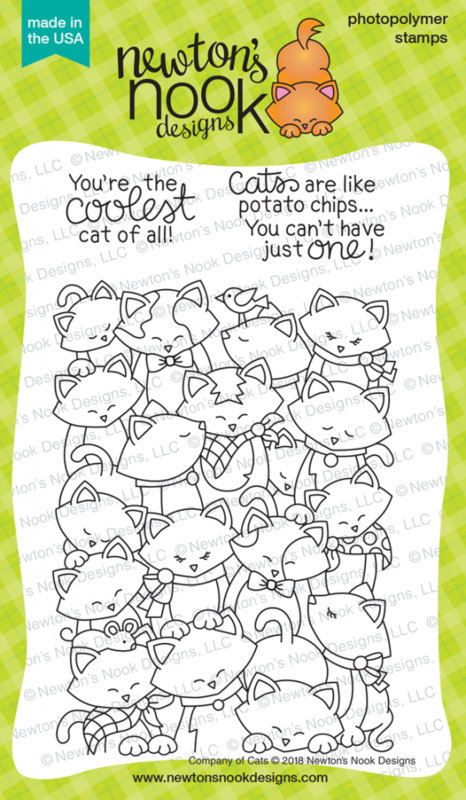 This is a delightful card that will please any cat lover. Thanks for the inspiration. Darling idea to make the pop up inside…and the sentiment is true…every life should have 9 cats. Very clever card design to go with this sentiment. 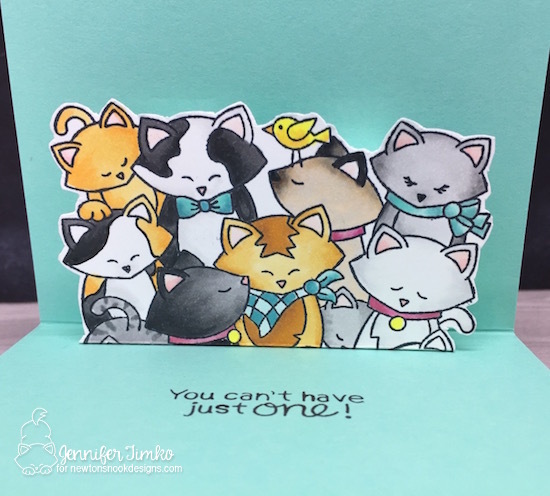 It’s so adorable how the kitties pop up in the center of the card! What a fun idea and a great way to use this set! Plus I love that teal color too!